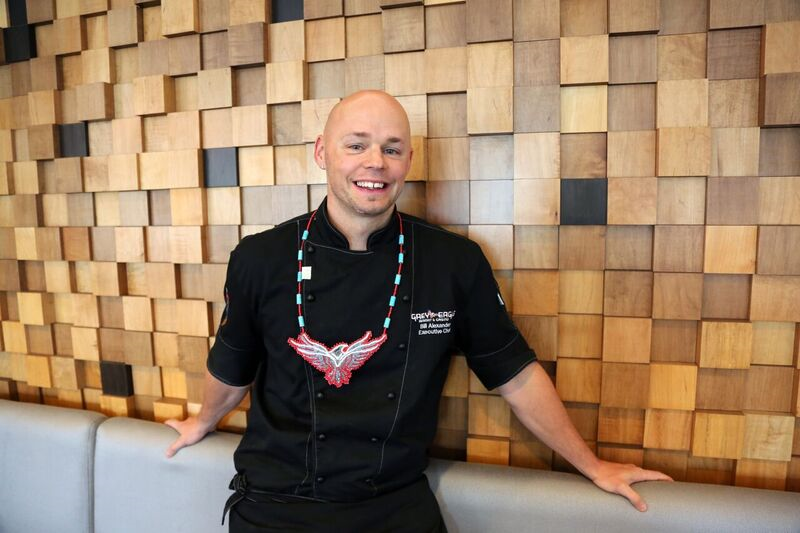 Canadian Indigenous born Bill Alexander is the Executive Chef at the Grey Eagle Resort & Casino, located on the beautiful TSUUT’INA Nation in Calgary Alberta. His early years were spent growing up in Ontario & Western Quebec with heavy influence from his mother & Mohawk community. A childhood spent farming, hunting, foraging and trading laid the foundation of locally sourced ingredients and the importance of knowing food origins. By the age of 12, Bill was cooking full meals for his family and community while thriving off an ignited passion for food and the happiness it inspired. At age 15 he began his first formal training in the restaurant industry leading to his first sous chef role by 17 and head chef role by 18 years of age. This inspired a thirst for traveling and continual honing new skills in places such as Australia, Japan, New Zealand, Germany, Italy, Prague, as well as the US. After years of working overseas, Chef Bill returned to Canada reaffirming that “food is a magical ingredient needed to create happy memories”, believing this sentiment is echoed in every corner of the world and is a universal language in itself. Over the last 20 years, Chef Bill has developed a highly decorated, award winning career with expertise in markets such as Hotels, Conference Centers, Corporate and Private Restaurants, Military & Defense Head Quarters, as well as consulting on 15+ menu concepts for 3rd party businesses. When the apron comes off, Chef Bill spends his time being a highly accomplished martial artist, personal trainer and motivational speaker; known for his passion and wanting to make a difference through culinary experiences. He believes that “food brings people to the table where we get to talk about the necessary change”.